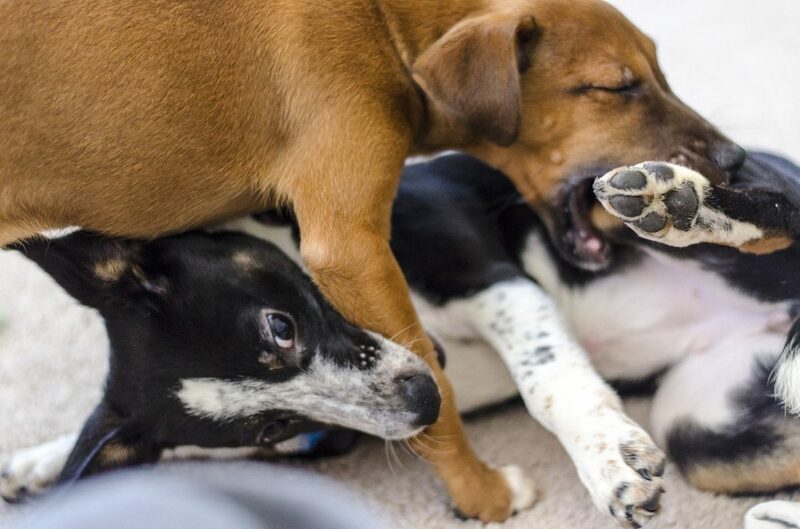 Many dogs really love rough-and-tumble play. But how do you know when your dog’s wrestling has gone too far? I recently got a 8wk pitbull & 10wk boxer. They play fight constantly, and sometimes it’s too aggressive for my liking. Should I be stopping this type of play? Check our blog (use the tabs to sort by topic) for past answers. Use the search function or the topic tabs to find relevant answers. Check out our training videos to get demonstrations of relevant training techniques. Sign up for a 15-minute or one hour troubleshooting call. One of our Certified Dog Behavior Consultants will work to understand where your training needs more work and help you come up with a plan for success. Are My Puppies Playing Too Rough? Observe the puppies to see if their play has nice back-and-forth. In general, if the puppies are taking turns chasing, tackling, and biting, the play is probably OK. If the play is a bit more one-sided, go to step 3. Watch the puppy’s body language. Do they seem loose and waggy, with huge play grins and bouncy movements? Or does one of them have wide eyes, pinned-back ears, or a tucked tail? How the dogs communicate with each other can tell you a lot about how they’re feeling. Pick up the bigger or more playful puppy (the one who does more chasing, tackling, etc). See what the less playful puppy does. Does she try to keep playing, or does she shake off and walk away? If she keeps trying to play with the puppy in your arms, then she’s saying that she enjoys the playtime. Let them have another go! If she welcomes the break from playtime with the other puppy, then it’s a sign the play was too rough for her. How Do I Interrupt My Puppy’s Playtime? It’s always good to teach your dogs to be able to listen to you even when they’re playing. When the puppies are little, you can just scoop them up. But what do you do when Alberta’s pit bull and boxer are over 50 pounds each? Practice teaching your puppies hand targets (one at a time, in separate training sessions) and then build up their ability to listen to you using the “Can You Listen When…?” game! Only start this came when your puppies are both already good at the hand targets we taught above. The game is described here. The goal of this game is to teach your dog to gradually ignore more and more distracting situations. It should be fun and relaxing – not a test! When your puppies are total pros at the “Can You Listen When…?” game, you’ll be able to start using hand targets to interrupt their playtime. Be sure to reward with lots of tasty treats when they get it right! Raising two puppies of the same age together is really tough. It’s incredibly important to teach the two puppies to be social with other people, dogs, surfaces, sounds, and more alone as well as together. Teach the puppies to sleep in separate crates and in different rooms. Be sure to walk them, train them, and socialize them separately. I use this socialization checklist from Dr. Sophia Yin. 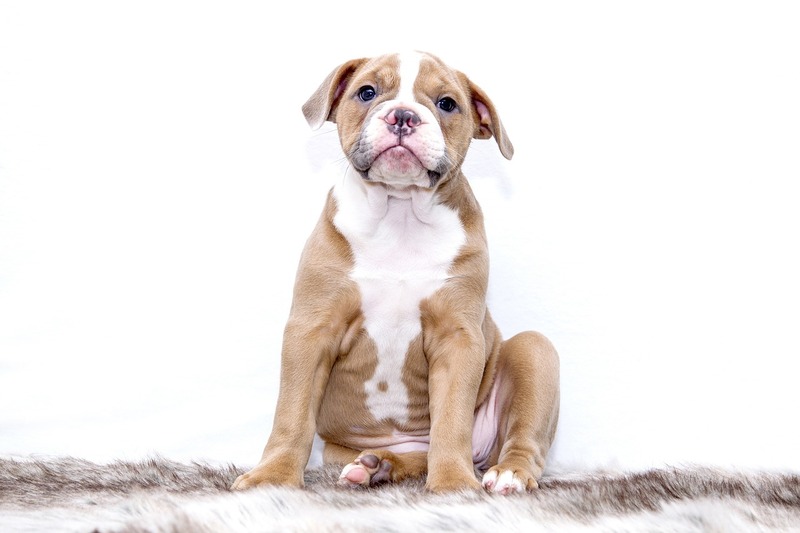 Aggression between puppies that are raised together is quite common as they hit social maturity. It’s kind of like sharing your house with your 30-year-old brother. Being careful to lay the foundations right now will help you keep the peace as they get older!